Recently I've been volunteering in 4th grade classrooms in a local school. I decided that after being out of the classroom for 5 years, it was time to reconnect with what's going on in classrooms today. 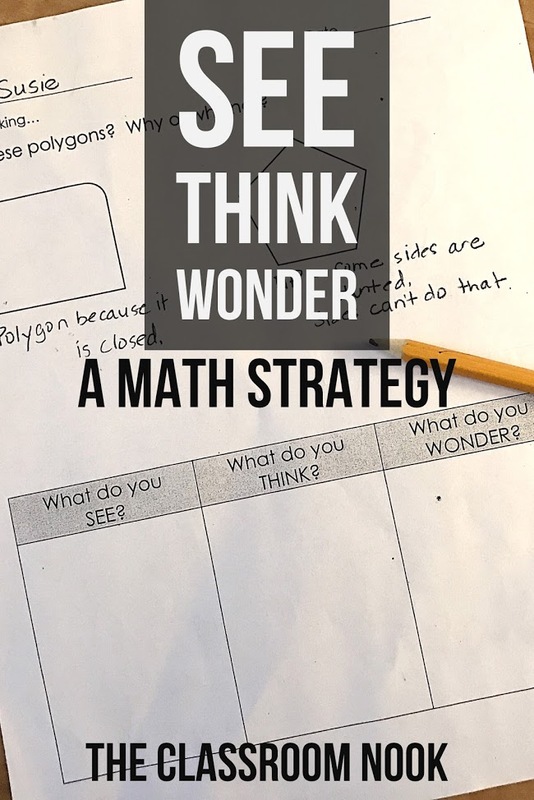 One lesson that I was helping out with a few weeks ago was on a new (at least new-to-me) math strategy called "SEE-THINK-WONDER." Have you seen/used this? It's a great lesson-opener. 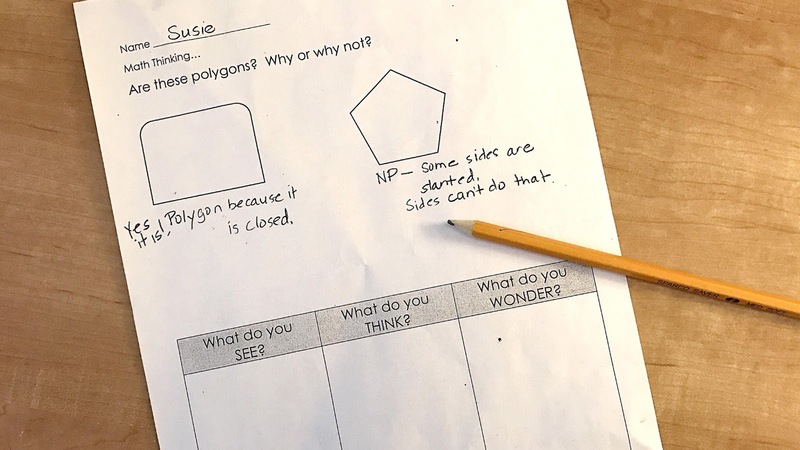 The students in this class were learning about polygons, however, this strategy can be used with any math concept. The students were given a worksheet that another (made-up) student, "Susie," had completed. 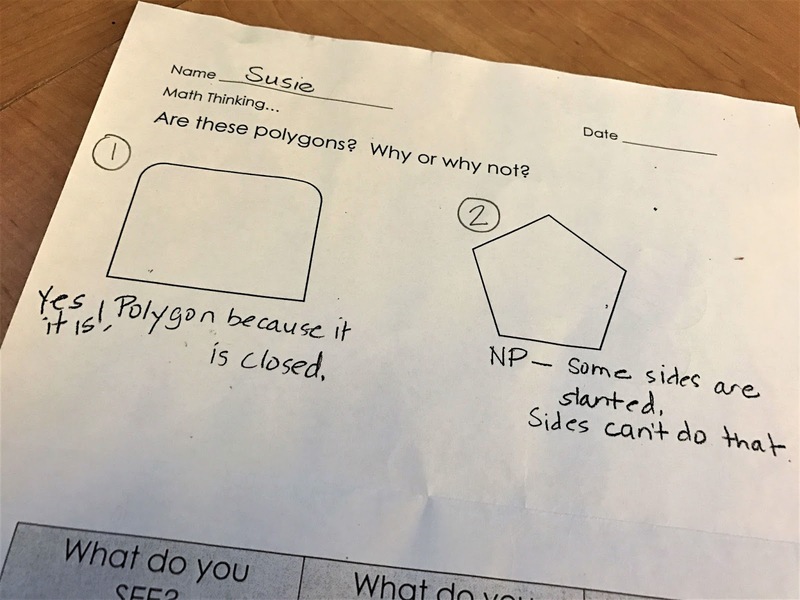 "Susie" was asked which of the two shapes on her paper were polygons. She wrote her answers as shown below. 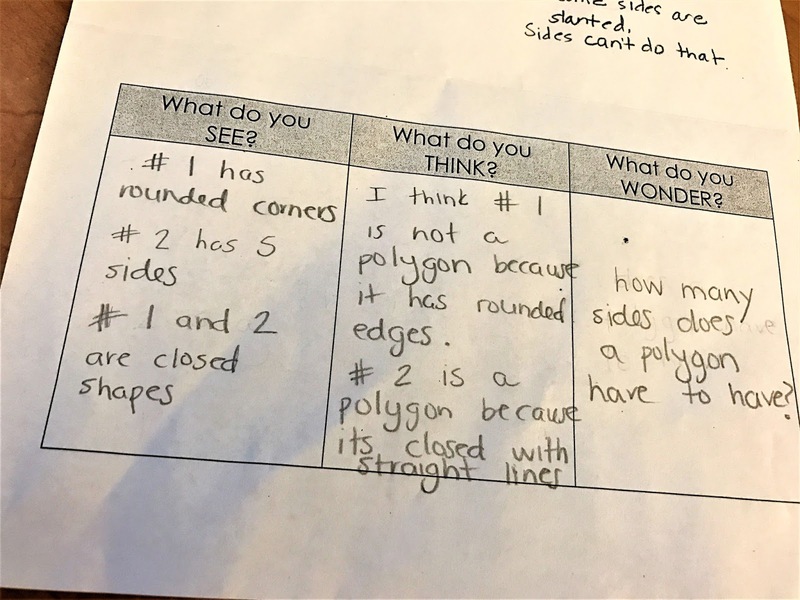 I really like this first step of just having students write down what they see because it really forces them to closely observe and analyze what is on the paper. It slows them down a bit from making any quick judgments without really paying attention to what is in front of this first. Next, they could write down what they thought about "Susie's" answer in the "What do you THINK?" column. Here students could record whether or not they thought the answers shown were right or not, and why. This is the part that let's you know if students really understand the concept because they have to explain their thinking. In the "What do you WONDER?" column students recorded anything they still had questions about the concept or about what "Susie" had written down. This part lends itself to a good classroom discussion as students chime in on each others' wonderings. It's always really interesting to see what students pick up on (and what they totally miss!) when they work on an activity like this. 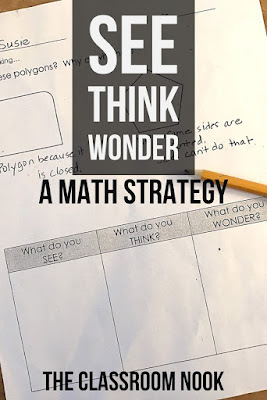 Give it a try in your own math class and see what your little thinkers come up with :).